As an artist who does embroidery, I’m very partial to working with kantha, especially the running stitch effect. I came across an essay, The Depiction of Sacred Trees on the Kanthas of Bengal, where Paola Manfredi tells us that trees are ‘a numinous manifestation, embodying divine energies’ and that the rippled effect of the kantha running stitch work is a representation of cosmic vibrations. A deep symbolism is attached to the humble running stitch. This enriches not just the action, but also one’s appreciation of the complexity of the thought and understanding that the women of Bengal were able to portray through their naive pictorial quilts made from recycled cloth. A recent exhibition Pohon Budi, at Bikaner House in New Delhi, was devoted to representations of the Tree of Life across cultures and got me thinking about the correlation between trees and this motif. On display were works from 30 countries including Cambodia, Malaysia, Thailand, Indonesia and India, which depicted creative renditions of the pohon budi, as it is called in Malaysian. The show presented traditional and contemporary expressions in textile, stone, ceramics, metal, glass, wood, paper, bead works and lacquerware, demonstrating how significant this concept has been for people and cultures throughout the world. It also sought to highlight the significance of trees in the planet’s ecosystem as well as indigenous art-making traditions that are in danger of extinction. ‘The five elements are the seed of which the world is the tree; and the eternal consciousness is the seed for the elements. As is the seed, so is the fruit (tree). This led me to a further excavation into sacred texts, where I found it to be a recurring mythical icon manifesting in numerous ways — the banyan, the lotus, the bodhi and Rag trees. The repeated representation of this concept as a physical tree was intriguing. I could not quite put it into perspective until I saw trees felled by storms in the month of May this year, when realisation dawned that trees are as vital for our ecosystem as consciousness is for our existence. This correlation has been apparent for centuries, but we tend to take it for granted. I was particularly upset about a flowering Gulmohar at its radiant best lying across the road, wrenched from its trunk, its wounded stump a reminder of our careless felling of trees to make way for high-rise developments and the adverse effect of this on the planet’s ecosystem. In Gurugram, where I live, a lot of outlying farmland has been sold to builders and instead of trees we now see tall cemented towers. And in the last 10 years the changing landscape has affected even the air we breathe. Every tree we lose only adds to our woes. So, it is with good reason that trees, emblematic of fertility and fecundity, also symbolise the essential life force that flows through all of creation. The symbolism of the form may have evolved from early 17th-century chintz designs. Intended for Western markets fascinated by chinoiserie, these fabrics depicted fanciful plants and trees, drawing inspiration from Chinese porcelain designs. These plant forms evolved into elaborate and exotic trees with birds, animals and insects and these designs could well represent the beginnings of a shift away from the reverence and symbolism that ancient cultures attributed to the tree motif, especially with regard to its representation in the Subcontinent. My first recall, on hearing about the Tree of Life was at a fashion show at the Crafts Museum in New Delhi — an audio-visual presentation showcasing India’s textile heritage through a retrospective of Ritu Kumar’s work in the early 1990s. 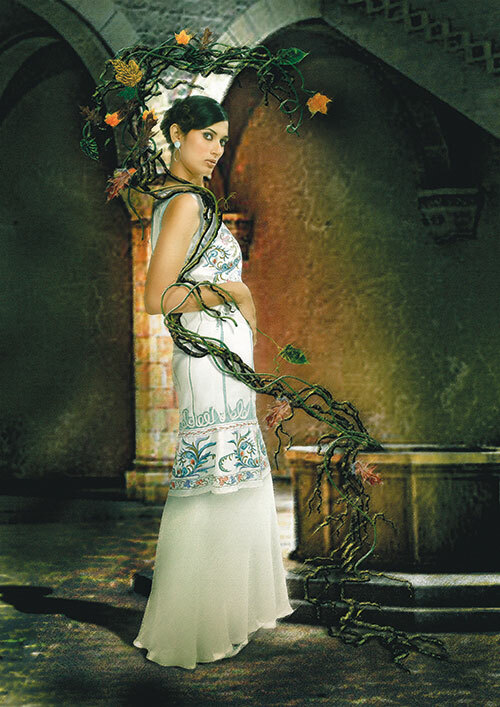 In 2008, Kumar also launched a signature perfume called The Tree of Life. Representations of trees and plant forms feature consistently in contemporary fashion. These evocations of natural abundance lend an interesting twist to the concept, where it is equated with a physical manifestation of plenty. A powerful folk depiction of the Tree of Life is a curious wall hanging made by Laxmi, Durgi and Sita, three Lambani women from the Bellary district in Karnataka. It is shown as half-man, half-woman, the left half is male, with stiff, rugged, unbending branches, and the right side as female, soft and curvaceous, laden with flowers and fruit. Created under the auspices of Dastkar, this piece combines mirror-work, patchwork, shells, beads and coins with a variety of embroidery stitches to provide an insightful commentary about the nature of human beings as perceived by these non-literate rural women. 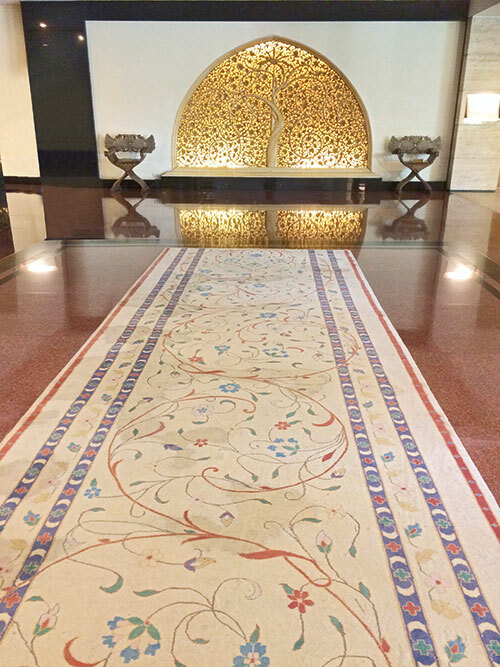 A marble replica of the carved screen at Sidi Saiyyed mosque was installed in the lobby of The Oberoi in New Delhi when it was built in the late 1960s, where it remained until April 2016 when renovation work began. The same jali design in a graphic motif is the logo for the Indian Institute of Management, Ahmedabad (IIMA) and Asif Shaikh, a celebrated embroiderer, has created a miniature version using miniscule stitches in ari embroidery. Even though one may have seen this backlit jali countless times at The Oberoi, there was no cognition of what it represented, other than a beautifully carved piece of marble. The Tree of Life, rich in mystic and religious representation, continues to find a place in our lives, though we may not always notice it. Each religion and culture portrays the Tree of Life in different ways. In Buddhism The ‘still point of the turning world’ beneath the Asvattha or bodhi tree, where the seated Buddha received enlightenment. In Christianity In the Dominican church of St Nicholas in Toruń, Poland, a 14th-century sculpture Crux Florida presents the crucifix with 12 leafy branches, each one featuring an apostle and quotations from the Bible. In Islam It is found in miniatures as well as prayer rugs from Turkey, Iran and other parts of the Middle East. The Egyptian take The ancient civilisation imagined a celestial Tree symbolising eternal renewal in the afterlife. A mystical link exists between the crucifix or Tree of Salvation and the Tree of Life, which grew beside each other in the Garden of Eden. Malaysian lore It is part of the creation myth of the Kayan people of Sarawak — the hornbill bird is usually perched at the top of the Tree in artistic renditions. Artistic representation The carved lattice window of the Sidi Saiyyed Mosque in Ahmedabad, built in 1573, is an exquisite example. 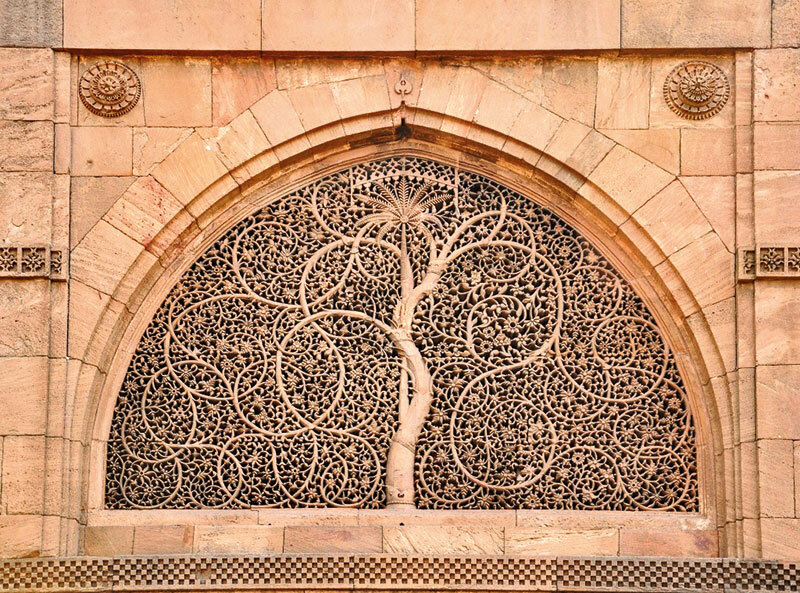 The red sandstone trellis with intertwining trunks of a date palm, arabesque-like flowering creepers and foliage is said to have been made by 45 artisans, taking six years to complete. Bappaditya and Rumi Biswas design flowing creepers into their signature handwoven jamdani saris, delineating the munificence of the natural world. And the larger-than-life forms highlight the contemporary predilection and reliance on material things. While Geisha Designs are romantic and optimistic, Shanker presents the motif more sparsely. Working with bandhni, she directs her concerns to the sustainability of crafting traditions in a fast-paced digitised world. Her isolated trees stand as a reminder to restore the balance through an informed continuance of an ancient heritage, rooted in the spiritual aspects of being. In his collection for Amazon India Couture Week 2015, besides the elaborate floral stitch work on the silk lehngas, he made a special reference to the network of local craftspeople who helped make his designs a reality.